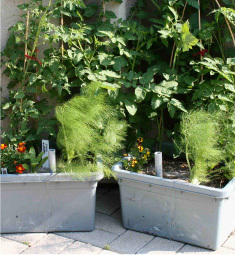 Imagine being able to get fresh vegetables from your rooftop, balcony terrace. With our Alternatives Containers, it’s not that hard to imagine! After lengthy experimentation toward finding the most suitable means of greening paved surfaces, our unique container garden method was adopted. Makes use of household compost. Can last up to 4 days without the water reservoir being replenished. Easy to move and adapt. Good quality soil is guaranteed. Our Guide to Set Up and Use Your Grower. To build your own container with a water reservoir, read our instructions on construction techniques from recuperated materials.